SAITAMA - Urawa Reds will be looking to shed their unwanted reputation as a team of choke artists once and for all when they take on fellow heavyweights Kashima Antlers in the two-leg J. League Championship final. The first leg takes place at Kashima on Tuesday night with the return match at Saitama Stadium on Saturday. The J. League title and a place at the Club World Cup next month is the prize that awaits the champions. Reds, whose one and only league crown came in 2006, have let the league title slip twice from their grasp over the last several seasons, most notably in 2007, when they lost 1-0 away to already relegated Yokohama FC on the final day of the season, a result that helped hand the trophy to Antlers. The former Asian champions also lost to Gamba Osaka 3-1 in extra time in the semifinal of the J. League Championship playoff last year — a game that they were well on top of toward the end of regulation time — before losing to the same opponents 2-1 in the Emperor’s Cup final on Jan. 1. This year, Reds have gone some way to showing they are now more accustomed to handling the pressure when it matters the most, finishing top of the overall standings to book a direct spot in the final, and also winning the League Cup. “We have had fantastic results over the course of the year but for us to shed this reputation we have to win this championship final,” Reds defender Tomoaki Makino told Kyodo News at training on Monday. Urawa finished a whopping 15 points ahead of third-place Kashima in the overall table. Antlers, the most successful team in Japan with seven league titles, three of which came successively from 2007-2009, reached the final after Mu Kanazaki headed the winner in a 1-0 victory away to Kawasaki Frontale in the semifinal playoff last Wednesday. “We have had a few weeks since our last game of the season against Yokohama F. Marinos and it will be important that we get our feel for game action back within the first 20 minutes tomorrow,” said Makino. Although Reds could be regarded as the true champions, having finished with the most points over the season, striker Zlatan Ljubijankic says the championship final provides Urawa with an opportunity to further furnish the trophy cabinet. “I see it as one trophy more for us,” Ljubijankic said. “We are really motivated to win it. It will be a great season if we win it,” said the Slovenian. With a change to the rules this postseason, including no extra time, Reds, from finishing top of the league, could win the title with two draws by the same score, but Petrovic did not see that as an advantage. “If we had these rules last season then we would have made it to the final (with a draw) and I think the regulations changed because it was pointed out in discussions that they were strange. I guess we were victims of it,” he said. “But over these two legs in the final I don’t see the revised rule as giving us an advantage. The chances of the same score in both games I reckon is about 5 percent so not that much of an advantage at all. 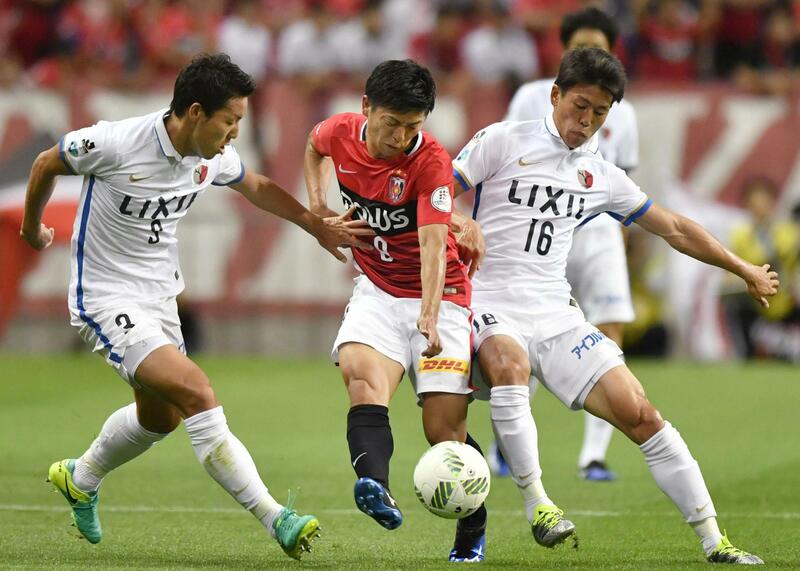 In the two league games this season, Antlers won 2-0 at Reds in June behind goals from Kanazaki and Yuma Suzuki, while a double from Tadanari Lee saw Reds win 2-1 at Kashima in July in the second stage.